When someone asks if your boss is a god, you say yes! Okay, that is just uncanny. Oh – I mean, he’s a dog. Damn lysdexia. Man, Shanna’s ruthless…and I love it. Being good is not necessarily being nice. Just not in YOUR world, Shanna. Silly Carol, that was a translation error: H.R. is actually a god. It’s a god eat god world out there. 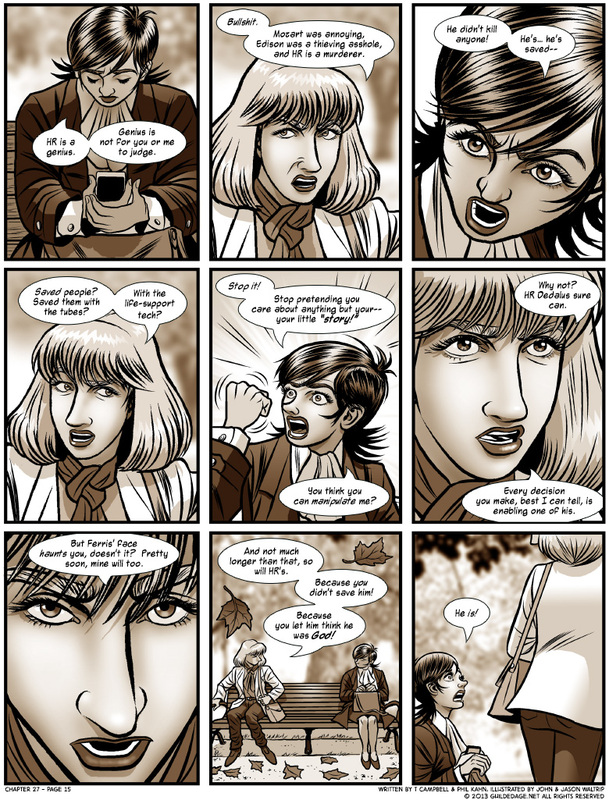 That last panel challenges the assumptions I’ve had about Carol: that she was the reasonable, conventional foil to HR, that she has been willing to overlook HR’s outrageous actions because she’s an ambitious, somewhat amoral corporate climber, that she was willing to cover up the murder because at this point, she’d be implicated, but she’s about hit her limit. That last panel, though, suggests she may have had her own madness, in her reverence for HR, all along. I think it’s more along the lines of her personally witnessing his godlike acts, which may or may not include bringing an entire universe into being. Whether he actually created Arkerra or, as he fears, merely “discovered” it, remains to be seen. Even in light of that, however, he has unquestionably performed godlike acts, even if they aren’t quite as all-mighty — and certainly not as all-knowing –as the followers of Abrahamic religions may be led to expect. What “godlike” acts has she seen him do? The two had a conversation about the nature of Arkerra, in which she insisted that it was just a computer game, albeit one behaving strangely, and she was dubious about HR’s claim that he “discovered” it. Frankly, I’ve always thought she was motivated by a bit of hero worship mixed with a little bit of suppressed romantic feelings; I’ve never gotten a read off of her as being ambitious except in the pursuit of the same ambitions she shares with H.R. It’s pretty obvious that she near worships him as a visionary, but this was a step further than I though she went. To gods, paradise and the abyss would just seem ordinary. The world(s) they rule would be like MMORPGs. If the Arkerrans could see us, would they think of us as gods? After eating boiled desert moss, I bet Dunkin’ Donuts and Starbucks would be the Arkerrans’ version of Ambrosia, the food of the gods. Shanna’s going in a tube. Or killed, but I would prefer the tube. I would prefer killed. I don’t need Shanna in Arkerra; and if she already has a well-known (to us) PC there, losing them will be worth losing her. Killed ? But … but … why ? I’d prefer her to completely flush out those mofos at Hurricane. They must pay for their crime(s). I love you forever for this reference. Take my babies. Just take them all. It’s been awhile since I read the book, been catching up with Tiffany Aching, but I think ‘dropped’ is a bit of a tame word for the physics that went into that event. Not all that good with conversions but the math comes out to roughly 20 miles an hour I think. Off the top of my head I’m getting roughly 13. Just the other day he did this trick where he put his hands together and pulled off his own thumb then put it back on without any bleeding and he can totally tell which card I pulled out of a deck! If that’s not godhood, I have no idea what is! HR’s got your nose! HR’s got your nose! What about Tesla, the geniuser than Eddison, and whose life the latter destroyed? Would you judge someone who, still to this day, holds the record for the longest man-made lighting, at about 40 meters? There’s Galois, too. Look up that one. Tesla was geniuser than Edison, less assholish than Edison, and CRAZIER than Edison. Sure, Edison fucked him over good, but I don’t think that accounts for all of Tesla’s foibles. Like the pigeon thing. Did you know Tesla was in love with a pigeon, and convinced it was mutual? Genius is always open to judgment. Knowledge, authority, age, power, singularity of vision, moral certitude… there is no trait that makes you immune to the facts, better than the truth, inviolably correct, beyond judgment. Sure Tesla was a genius, but he had OCD so bad that sometimes he could barely function, and he believed in sterilization of the eugenically ‘unfit’. you’re right, but that’s not really a bad thing. We wouldn’t (or rather, we shouldn’t >.>) turn to Tesla to get his opinion on who should and shouldn’t be allowed to procreate, but that doesn’t mean he shouldn’t be respected when it came to his thoughts on what he was actually an expert on. It’s like one of the other webcomics I read said: Just because a person is a genius in one subject doesn’t mean you have to take their word on all subjects. Don’t ask a chess master about war tactics “Send in the clergy! They can move diagonally!”. Galois just reinforces her point. I’ve never heard of a more insufferable person; why do you think he was killed in a duel? You think there was still a face? You want a story? I saw a story once. And Ferris was the lucky one. Yes, Ferris died. But he didn’t have to see what’s going to happen. He won’t see what happens next. Well, Ms. Cochran? You’ve got me all figured out. You’ve got such a perfect read on me. Did my voice raise that time? Beautiful. I tip my internet hat to you. I keep seeing that piercing stare and equally piercing schnoz and imagining a red scarf over that mouth. Who knows what evil lurks in the hearts of men? The Shanna Knows. Really Carol? Texting during a covert meeting? For shame! Clear delusion or crazy plot twist? You decide! Well, maybe this was their reasons, maybe it wasn’t, but either way I’m enjoying the ride! Wow, Carol’s actually shaking her fist at her. Like, actually shaking it. I think some of H.R.’s love of melodrama has rubbed off on her. Sooo Carol … you say he hasn’t killed anyone ? What about Ferris, huh ? He wasn’t “killed”. He was terminated. They rehired Ferris at a lower tier. Now, instead of department head, he’s just a hired hand. Carol’s gonna spill the beans and, if this Shanna is anything like the Shanna I’ve been meeting in the Fans universe, she might get caught up in it as well. But probably in some role subversive to HR, such as trying to protect the 5 as they gather the information to accuse him. She’s moral, so the possibility of destroying a universe for the sake of the story will probably stop her. Hmm… I dunno why but Shanna really, REALLY annoys me… Especially her earlier smug-faced appearences. That said, the point at which Ferris died was probably a point during which I no longer enjoyed the Real World segments of the comic… It became really …different? I guess thats the word. On the subject of tubes, I think one is for Ferris and one is for Shanna. It’s great, the way she keeps taunting Carol with her own impending elimination. Those are ten-pound balls, right there. …Welp that was my mistake. Meant Carol, but wrote Ferris. Buuut… That may be an interesting twist if it was someone else’s body/I doubt Carol looked into that bag too much to find the head being there or not. Now imagining Ferris’ head floating in a tank.